A new update for the Samsung Galaxy S4 on Verizon has been approved (and may even be rolling out already) as build VRUEMK2. The update appears to be pretty minor while addressing a few bugs here and there. Things like Email connectivity have been improved, along with making data roaming more consistent in Canada and Mexico, and better connections while using proxy servers. But maybe most importantly, the update makes it so that non-Samsung chargers will work correctly with the phone. For those of you with multiple chargers lying around from various phones, throw yourselves a little party. Verizon’s support page shows that the update is 329MB in size, however, that seems wrong and excessive for something this minor. 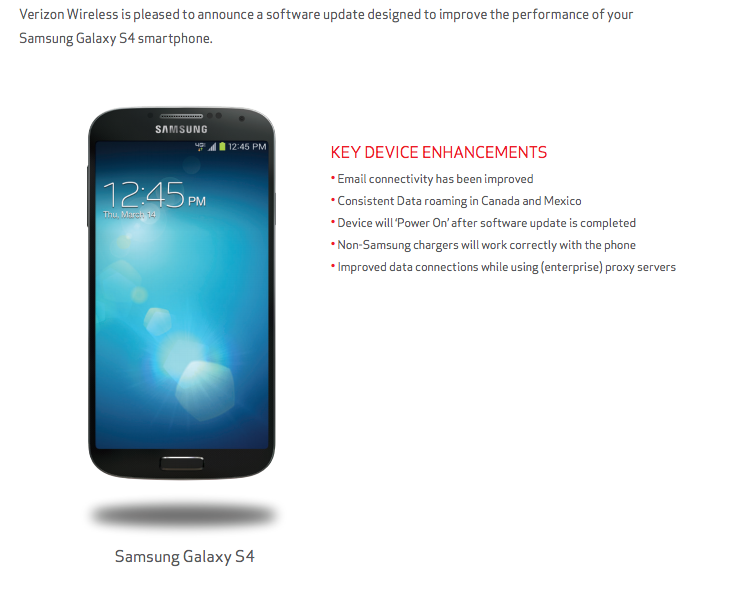 I’d imagine the documents haven’t been updated yet and are still showing the 4.3 with Galaxy Gear update.